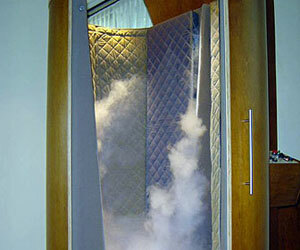 Another modern variety of the sauna – is cryosauna. And the variety is literally. The temperature in a sauna is not above zero but below zero. Cryosauna is a special capsule, which due to the use of liquid nitrogen vapor temperature drops to minus 160 degrees Celsius. The time spent in such capsule is not more than two or three minutes. But there is nothing to fear. During this time, the skin’s surface has time to cool down to zero degrees that in no way can lead to colds. On the contrary - a dozen such sessions awaken your immune system and you will be much more robust to various colds. Moreover, cryosaunas is even treated rheumatism and arthritis. There are guidelines that should be followed when visiting cryosauna. First, as has been said, while visiting a sauna should not exceed three minutes. Second, you need to warm your fingers and toes, ears and face. Here you will be helped warm socks, mittens, hats, and a special bandage on his face. Third, do not go cryosauna during acute severe respiratory diseases and the presence of viral infections. Indications for use cryosauna are varicose veins, hypertension, migraine. Also cryosauna perfectly proved in the treatment of neurodermatitis, allergic skin rashes and psoriasis. Men can use cryosauna to increase potency and prevent prostatitis. Cryosauna widely is used as a means of relaxation and recovery after major exercise in the sport, with severe physical and emotional conditions, as well as after long-term treatment of serious diseases. Eventually cryosauna is a great way to relax and improve the mood after a hard day's work.